I remember looking after Big Al- now a strapping five years old – when he was a toddler. The saucepan cupboard was one of his favourite places: because, teamed with a wooden spoon, you could do one of two things. You could make an outrageously loud noise; and you could pretend-cook. But Al was no fool. He knew you couldn’t pretend-cook without food. And I’d throw open my bounteous pasta cupboard and we would raid it for farfalle, and tortellini, and fusilli, and penne. Oh, macaroni. Numbered like the stars, adored and stirred studiously by small boys. I would leave the kitchen for an instant and return to find boy and dog, both crunching contentedly. 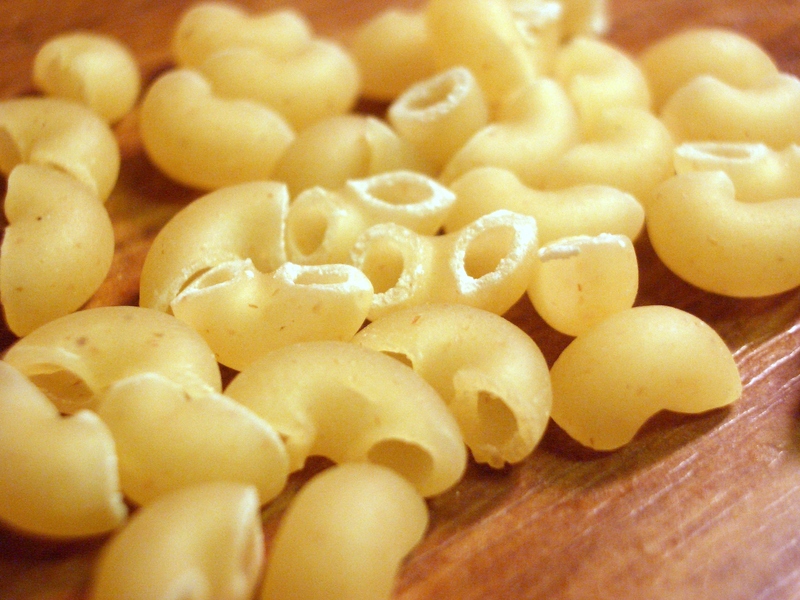 Macaroni was peasant-food in Italy. Teamed with cheese sauce it is one of my great comfort foods. You can get macaronic language too, you know. Macaronic language is peasant-language. It gets its name from the New Latin macaronicus, which in turn comes from the Italian word maccarone, the Italian word for dumpling. Peasant food. It is a mix between Latin and any spiel you care to throw in. Used memorably in that raunchiest of classics made respectable by Carl Orff, Carmina Burana. Secular songs for singers and choruses to be sung together with instruments and magic images. A heady mix of Latin, Middle High German and old Provencale, it throws together syllables with raw energy, hacking at three languages to make a savage hymn to the Spring. There are other Macaronic poems. Like that in the second lesson of Nine Lessons and Carols: In Dulci Jubilo. It was written by an old monk in 1328, in a mix of Latin and High German. The monk, Heinrich Seuse, claims to have had a dream in which angels came to him, and asked him to dance, and sang the words to him. Which, translated, says roughly that our heart’s joy lies in the manger, leuchtet vie die sonne -shining like the sun – in the mother’s lap. It fills me with the sudden urge to mix up modern English with Latin and see what happens. Posted in Christmas, UncategorizedTagged christmas, in dulci jubilo, macaroni, Nine Lessons and CarolsBookmark the permalink. Thank you: I’ve been wondering about macaronic for the past decade ever since a client called one of my colleagues in Pamplona “un poco macarónico”. Words that stick in your head, eh? He was a French engineer, so the term must exist in French: I looked in the Spanish dictionary to no avail. It certainly lends itself ut innuendo, Col! I have a sudden urge to have macaroni for supper. I’ll make Tom sing for it. You forget just how good it is until you taste it again, don’t you, Andra? It has distinct possibilities, Tammy. It could, Tandy….I wonder if my Latin is that good. Or dodgy. ah, Mac & Cheese, the kindly peasant of comfort foods! At the price of cheese in Canada, though, it is often the feast of kings. I used to sing with a group called the Pearsall Singers, based in Beach (near Bath, and not a beach in sight) close to Bitton with which Pearsall had links. His gravestone was brought from Switzerland and erected in the churchyard there. I absolutely love that hymn from my choir-singing days… thanks for the reminder.